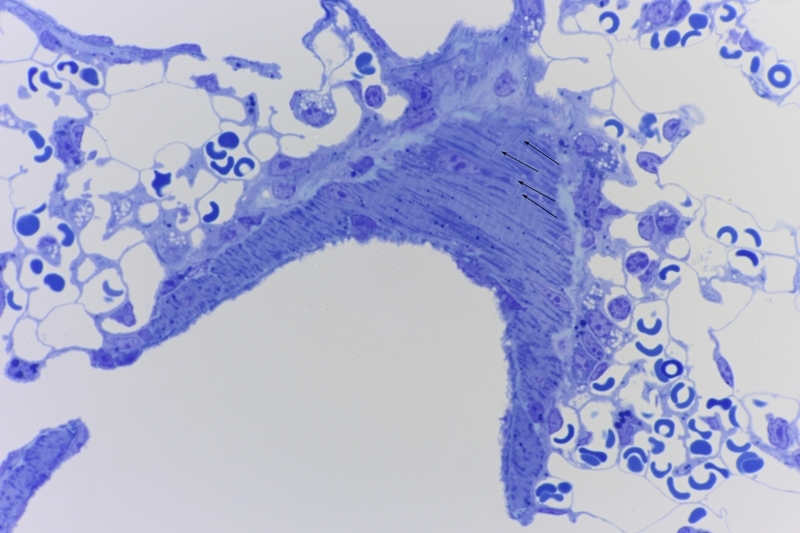 The primary purpose of this lung section was to compare the morphology of lung tissue cells fixed and embedded in different fixatives and resins. In the assessment of the sections some abnormal cells were found. 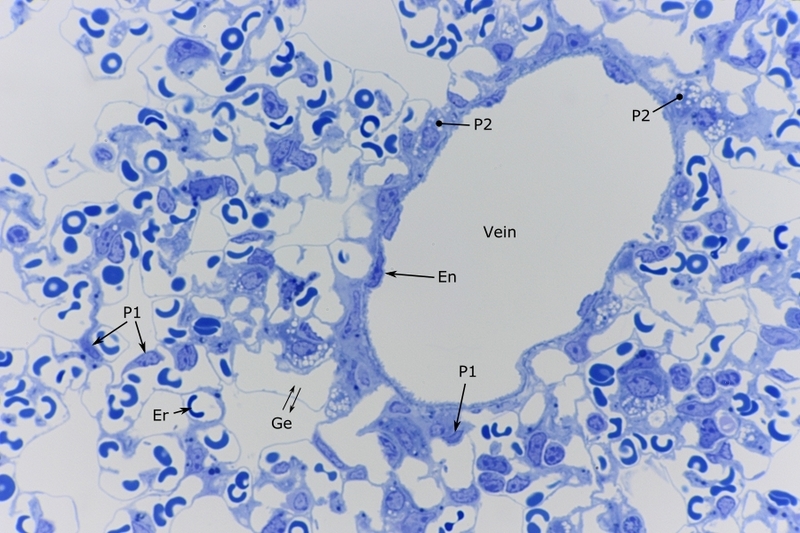 Therefore the second purpose was the possible identification of those cells. It is known that there is a difference in morphology between ‘single’ and ‘double’ fixed tissue . 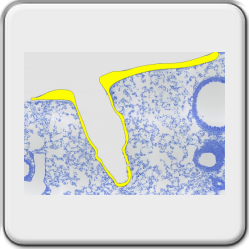 Lung tissue was chosen to assess the morphological differences. 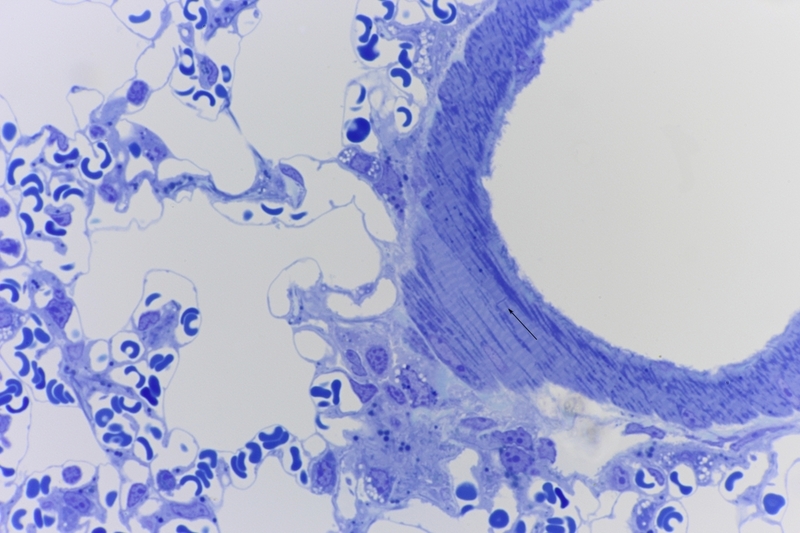 Lung has the advantage that the different cells are clearly visible through the large hollow spaces. To clarify the differences, a simple single immersion fixation with 4% formaldehyde and a more complicated perfusion fixation with a mixture of formaldehyde and glutaraldehyde was chosen. After removal of the tissue from the body, the tissue was secondary fixed with osmium tetroxide. 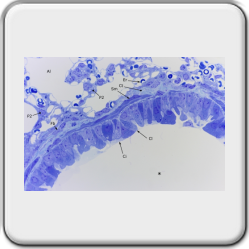 The immersion-fixed tissue comes from a rat. 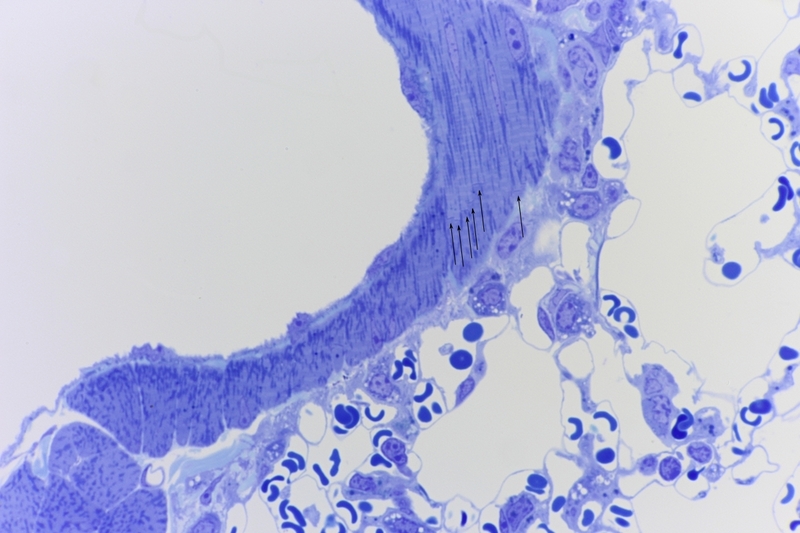 The perfusion-fixed tissue comes from a mouse. The formaldehyde fixed lung was cut in 2mm thick sections. The sections were washed out in tap water and dehydrated in an ethanol series of 50%, 70%, 85%, 95% and 100%. 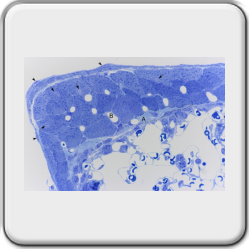 The tissue was embedded in Technovit 7100. 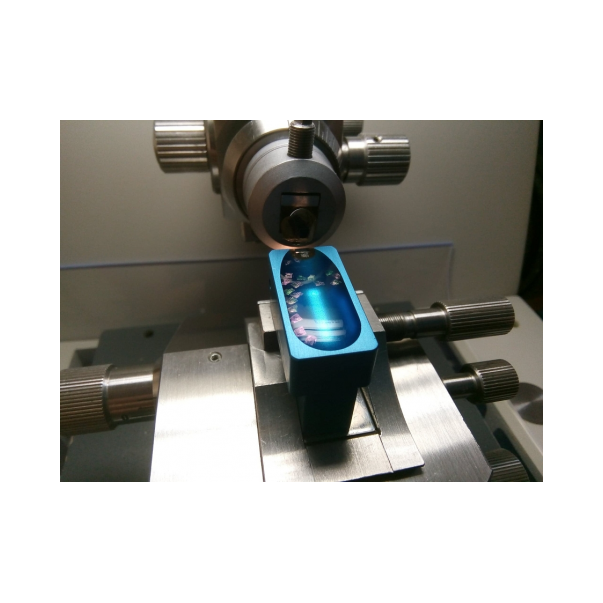 Technovit 7100 is a plastic embedding system based on HEMA (2-hydroxyethyl methacrylate) . 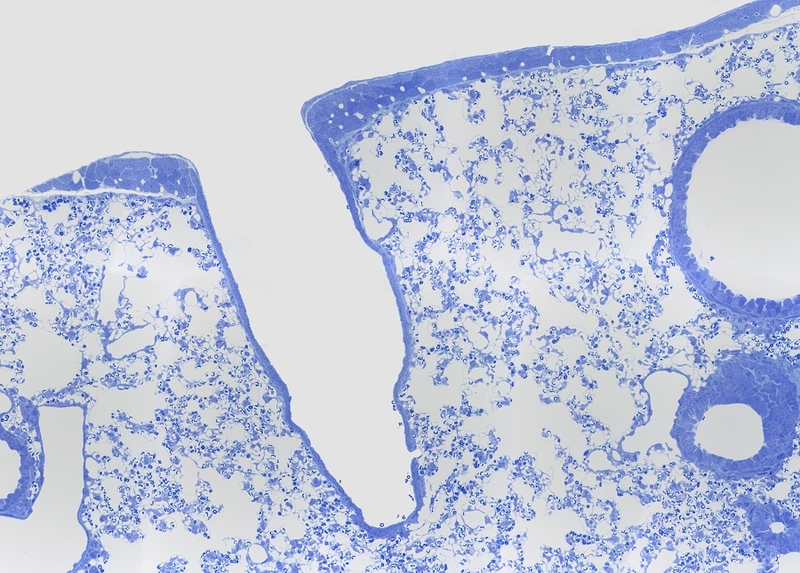 Sections (1,5µm) were cut on a LKB 2218 Historange rotationmicrotome with a Leica tungsten carbide knife . Sections were dried at 70 degrees Celsius and stained with 1% toluidine blue in 1% sodium tetraborate in distilled water . The sections were mounted in Depex, a neutral plastic resin . 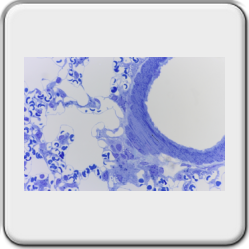 There is little data available on the perfusion-fixed tissue. The reason for this is that the author did not do this himself. It should be noted with certainty that the tissue is fixed with a formaldehyde glutaraldehyde mixture according to M.J. Karnovsky. Karnovsky developed the mixture and this is still recommended for light and electron microscopy. In this case the mixture ratio was 2% formalin and 2,5% glutaraldehyde in a buffered solution . The tissue is then secondary fixed with osmium tetroxide. After dehydration it is embedded in an epoxy resin EPON 812 . 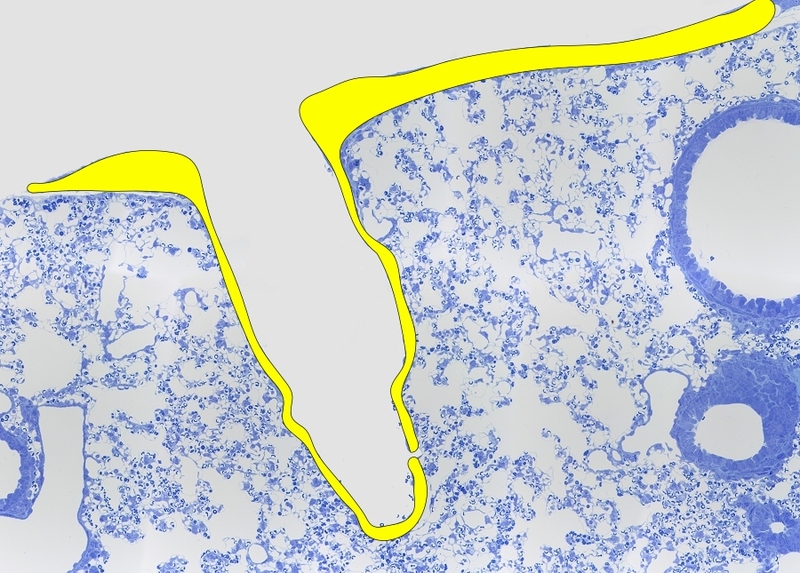 Sections (0,5µm) were cut on a Reichert-Jung Utracut E ultramicrotome with a Diatome diamond knife . 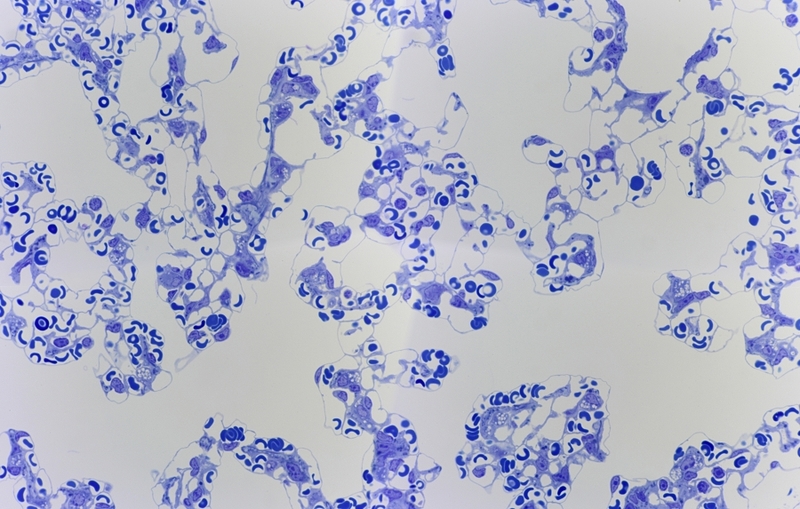 Sections were dried at 70 degrees Celsius and stained with 1% toluidine blue in 1% sodium tetraborate in distilled water . The sections were mounted in Depex, a neutral plastic resin . After the Depex resin was dried the pictures were taken on a Leitz Orthoplan microscope with plan apo lenses and Canon 700D camera. 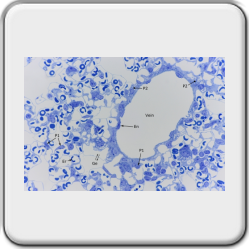 Common cells in lung tissue are: erythrocytes, pneumocytes type I, pneumocytes type II, alveolar macrophages, fibroblasts and endothelial cells . 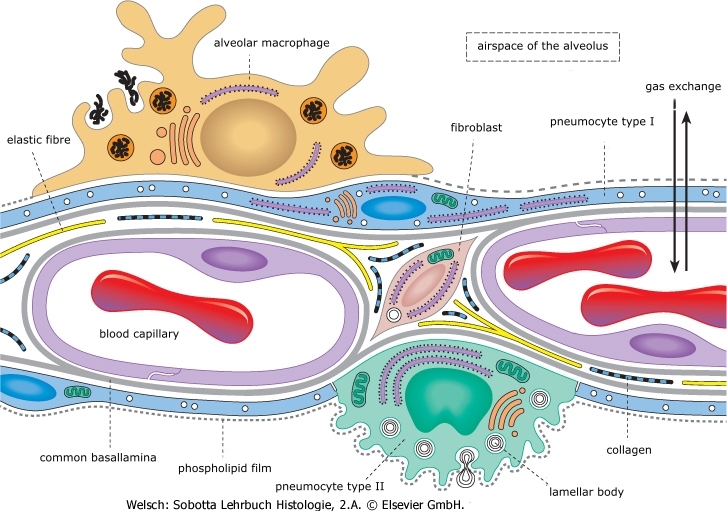 All pneumocytes are interconnected with zonulae occludentes and lie on a bassallamina. The strongly flattened pneumocytes I are approx. 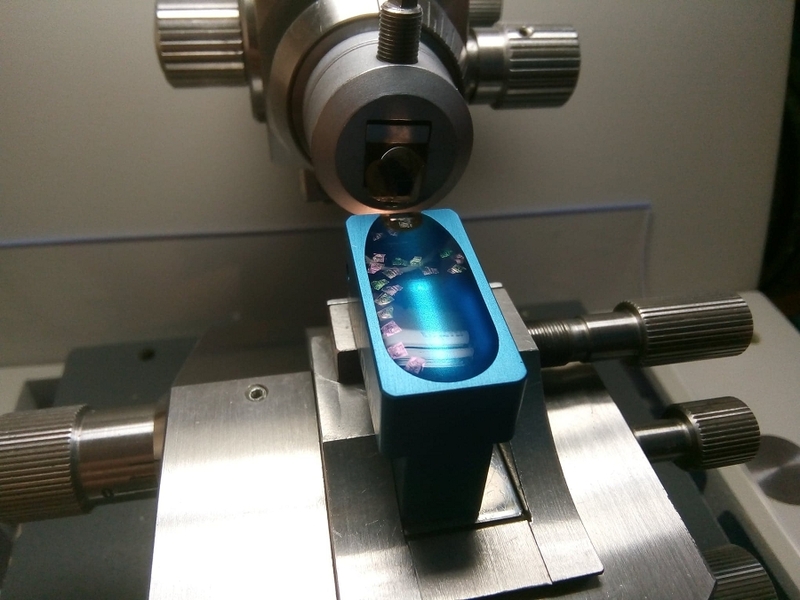 0.2µm thick and occupy approx. 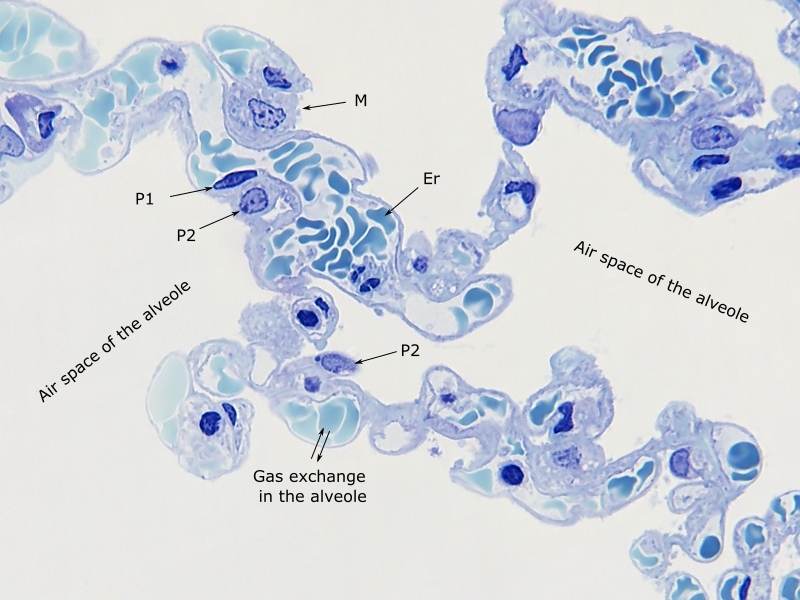 90% of the alveolar surface, but their total number in one alveolus is smaller (40%) than that of the pneumocytes II (60%). They have some organelles near the flattened nucleus . 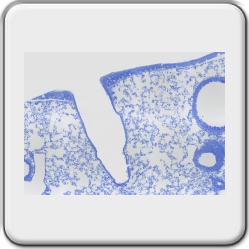 The shape of pneumocytes II changes from pillow-shaped to cubic, they occupy about 10% of the surface of an alveolus and carry some microvilli apically. 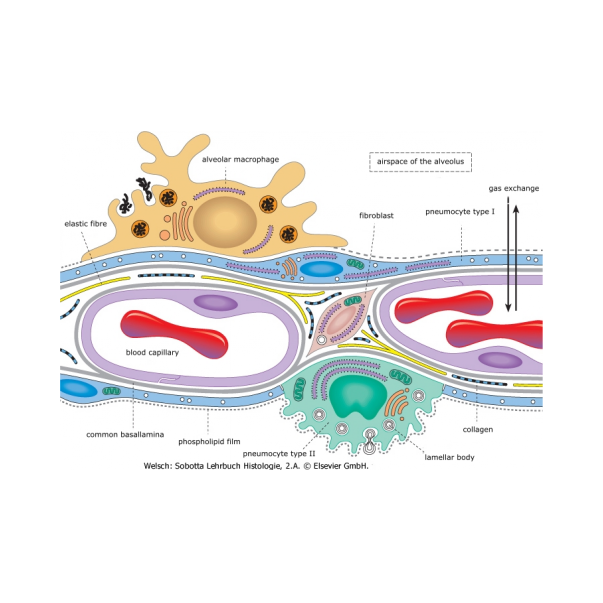 The nucleus of pneumocytes II is rounded. The cytoplasm contains large amounts of cytokeratin, an extensive golgi apparatus, well developed rough ER and numerous mitochondria. 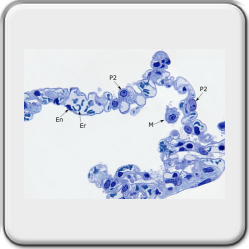 Characteristic are lamellar bodies, which probably originate from multivesicular bodies and contain densely packed lamellar phospholipid-rich material. 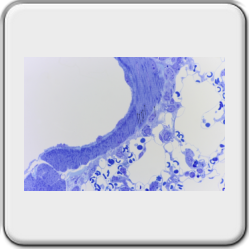 When the alveolar epithelium is injured, pneumocytes II can proliferate and differ to pneumocytes I. 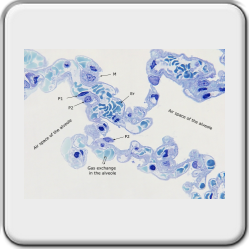 The pneumocytes I are differentiated cells that can no longer divide . 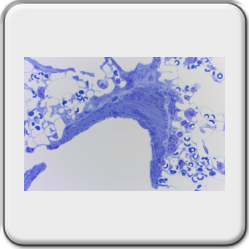 The alveoli regularly contain macrophages called alveolar macrophages. 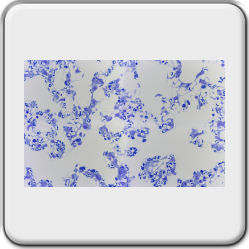 For example, they phagocytize dust particles or bacteria that have penetrated into the alveoli. They therefore have a brownish colour and have long finger and lamella shapes. Lysosomes are particularly numerous in the cytoplasm . 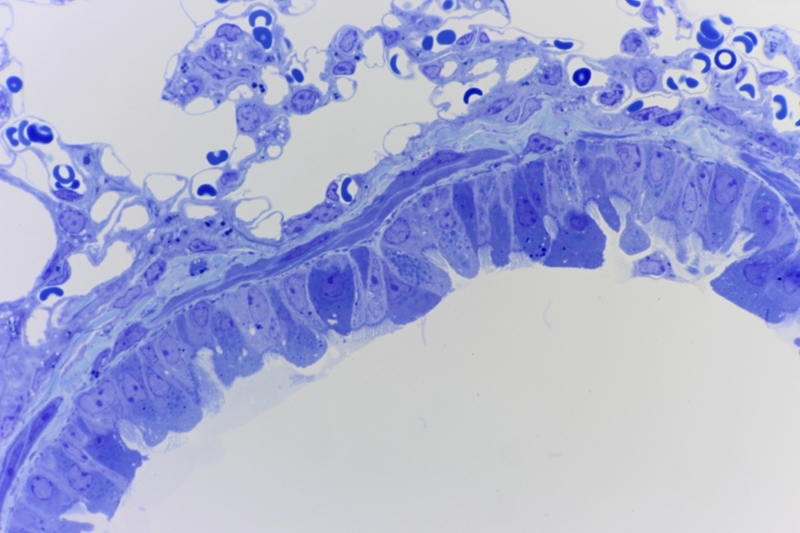 During the study of the sections, a cell was discovered which was common to the author but not in this type of tissue. 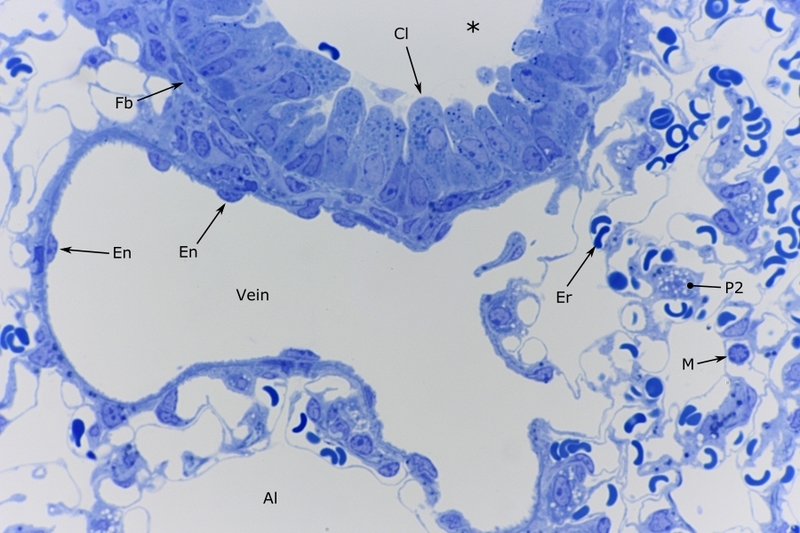 At higher magnifications some characteristics were found that correspond to cardiomyocytes. 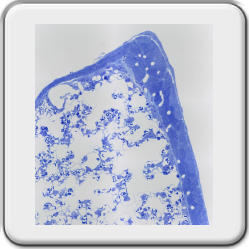 Cell nuclei are located in the middle of the cell's cytoplasm, striated cells, myofibrils appear to be visible in transversely cut cells and intercalated discs are visible in sagittal cut cells. 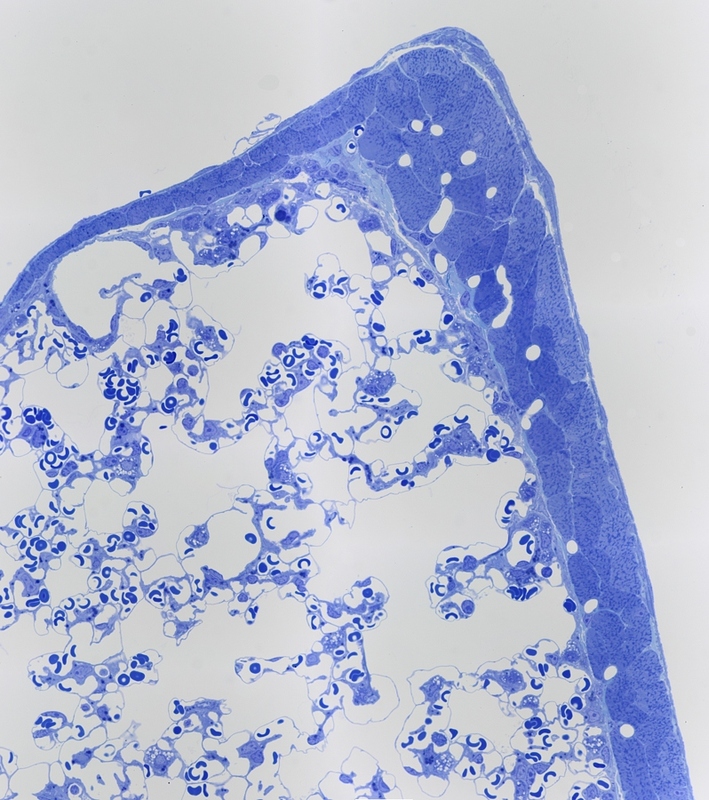 It seems that these are cardiomyocyte-like cells. 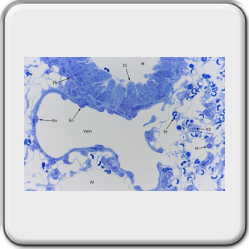 Research in various literature describes indeed the occurrence of cardiomyocytes in mainly the pulmonary veins of rodents  but also occurs in humans  . Because the origin and function is not entirely clear, I will not comment further on this. It is clear that more study is necessary. 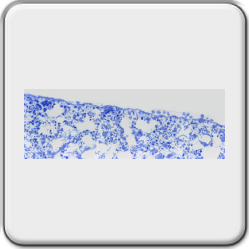 In figures 1A and 1B the lung tissue embedded in Technovit 7100 can be seen and photographed with a Leitz 63x plan apo after 1.4 objective. The magnification here is 630x. 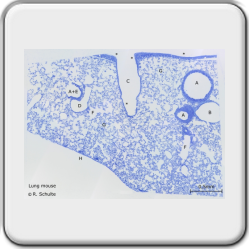 In figures 2A to 2E the lung tissue embedded in epon 812 can also be seen photographed with a Leitz 63x plan apo after 1.4 objective. Also here is the magnification 630x. 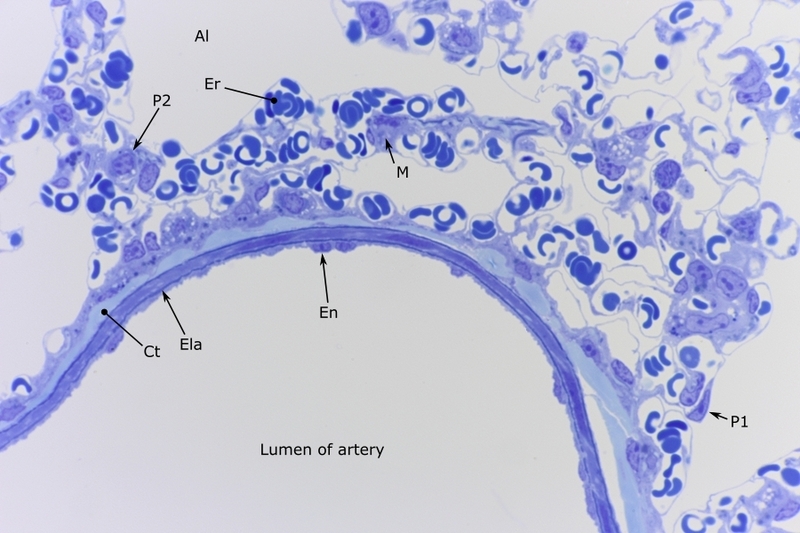 Figures 3A to 3D shows cardiomyocytes and intercalated discs. Magnification 630x. More details of the Epon section. Arvid B. Maunsbach, Björn A. Afzelius. Biomedical electron microscopy, illustrated methods and interpretations. 1998, ISBN 978-0-12-480610-8, page 32. Division Kulzer Technique, Kulzer GmbH - Division Technik - Philipp-Reis-Str. 8/13 - 61273 Wehrheim – Germany. Leica Microsystems B.V. All Microscopy and Histology, Vlierweg 20, 1032 LG Amsterdam, Netherlands. Prof. Dr. Peter Bock, Romeis Mikroskopische Technik, 17th edition 1989, ISBN: 3-541-11227-1, Pag 248, index 3.2 Schnellfärbung mit Toluidinblau O.
 Maria Mulisch and Ulrich Welsch, Romeis Mikroskopische Technik, 18th edition 2010, ISBN: 978-3-8274-1676-6, Pag 98, index 2.3.2.2.3 Fixierungsgemische mit Glutaraldehyd und Formaldehyd. Prof. Dr. med. Dr. rer. nat. 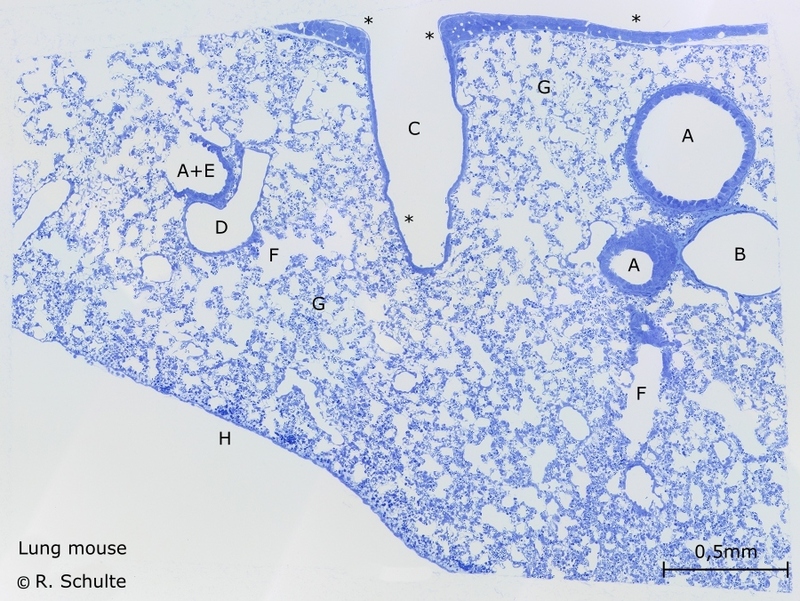 Ulrich Welsch, Sobotta Welsch Lehrbuch Histologie, 2th edition 2006, ISBN: 978-3-437-44430-2, Pag 323-328. 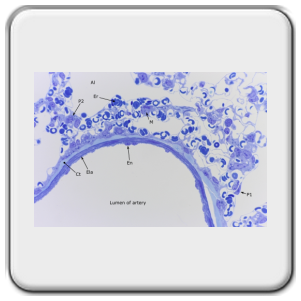 Cheryl L. Scudamore, A practical guide to the histology of the mouse, ISBN: 978-1-119-94120-0, Pag 192, 11.5.3 Background lesions in the lung. Download page 191-193, click here. 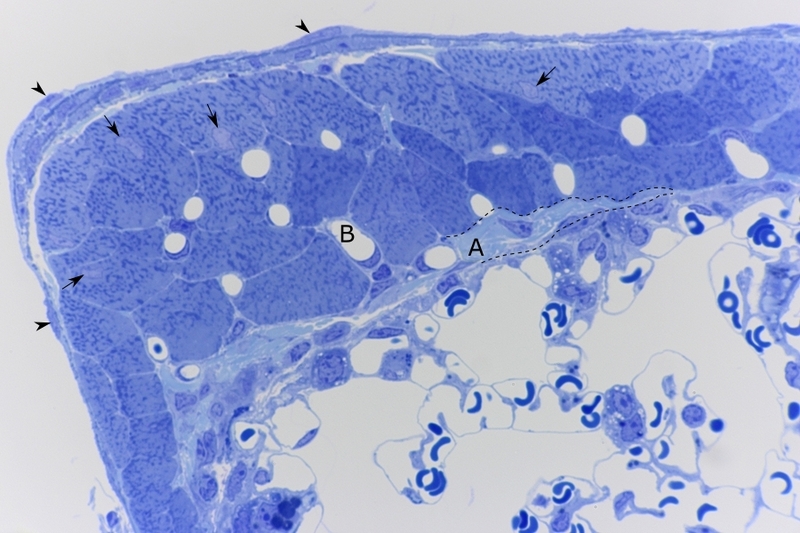 Josef Mueller-Hoecker, Frigga Beitinger, Of rodents and humans: a light microscopic and ultrastructural study on cardiomyocytes in pulmonary veins, 2008 5(3):152-158. Download the whole article as pdf, click here. 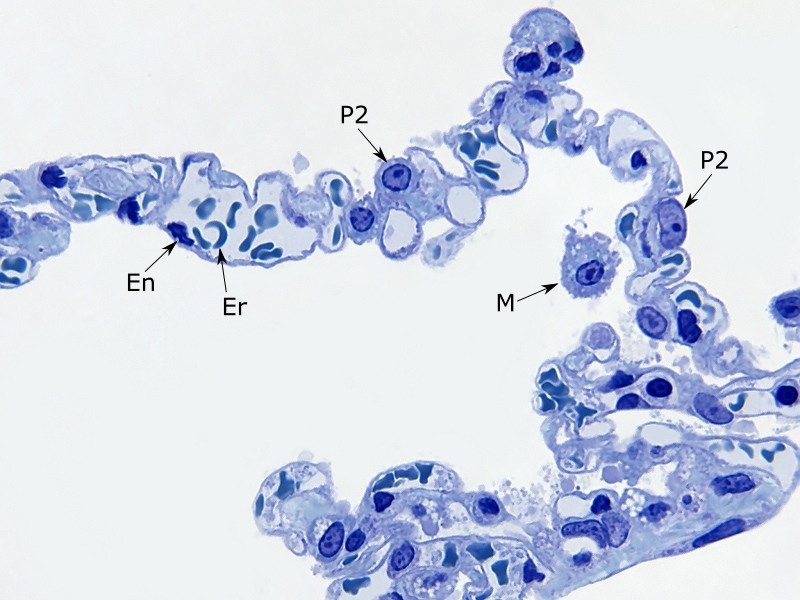 Martin P. Kracklauer, Han-Zhong Feng, Discontinuous thoracic venous cardiomyocytes and heart exhibit synchronized developmental switch of troponin isoforms, 2013, 280(3): 880–891. Dowmload the whole article as pdf, click here.